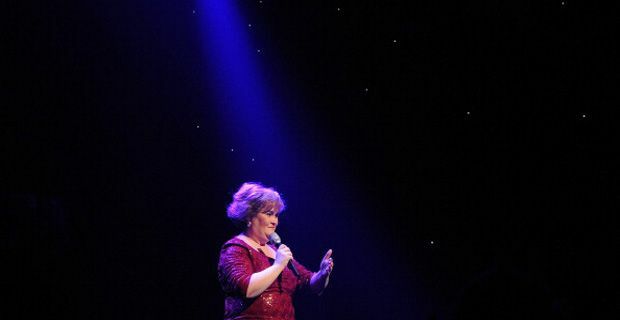 Following in the footsteps of some of the biggest names in music like Elvis, Elton John, Tom Jones and er... Celine Dion, Scotland’s very own Susan Boyle looks set to land a multi million dollar residency in Las Vegas. Having performed with her childhood hero, Donny Osmond live on stage at the Flamingo Hotel back in October last year, Susan seems to have acquired a taste for the razzmatazz of Sin City. She is currently in negotiations with some of the city’s leading hotel casinos and looks like she could be pocketing a tidy chunk of change from her time there. She is however unlikely to suddenly abandon Scottish thrift to the desert winds and start clocking up vast champagne bills and generally swanning around the strip in a fleet of pimped limousines. To her immense credit, Susan has never allowed herself to be swept away by the trappings of wealth and fame. Indeed a source gave the Daily Mirror some insight into what her rider may look like. "This is the year that I feel that I would be able to give an audience what they want. I've always wanted to do my own show and now I feel confident enough to give it a go. "If this works well, then the world is my oyster and 2014 will be a global tour. I've chosen my favourite songs from past albums and also new songs that not only have I wanted to perform for years, but resonate with me, and I hope my fans will love."